[prMac.com] Hamburg, Germany - Gryphos GmbH today is proud to announce the release of Shaderific version 4.2, a major update of its OpenGL ES shader development application for iOS. Shaderific provides the full range of shader development with the OpenGL Shading Language (GLSL) on tablet computers and mobile devices. Vertex and fragment shader code can be created, edited and compiled on the device and all changes are visible instantly. There is no need to use a personal computer (laptop or desktop) in the shader development process anymore. 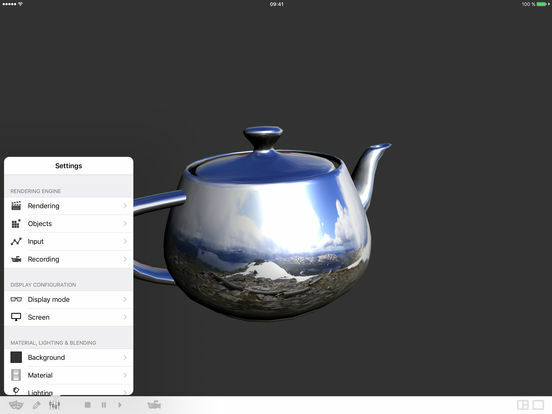 The update introduces a new display mode showing render view and editor side by side. Using the new display mode it is possible to work on a shader and see the results of code changes almost instantaneously. Shader compilation is triggered automatically by any change of the shader code without interrupting the editing process. Furthermore, clear color, material colors, light position, blending parameters and custom uniforms are now saved for each shader separately. The new feature vastly improves the ability of switching between different shaders without loosing specific uniform configurations. This is especially helpful when utilizing the full flexibility provided by defining up to 20 custom uniforms per shader. Shaderific 4.2 is available as a paid app for $9.99 (USD), or the local equivalent, on the iTunes App Store. Review copies are available upon request. Founded in 2007, Gryphos GmbH is a small consulting and development company located in Hamburg, Germany. Since 2011 we are focussing on educational and utility software for iOS. Copyright (C) 2011-2017 Gryphos GmbH / All Rights Reserved. Apple, the Apple logo, iPhone, iPod and iPad are registered trademarks of Apple Inc. in the U.S. and/or other countries. OpenGL ES and oval logo are registered trademarks of Silicon Graphics, Inc. in the United States and/or other countries worldwide. Products bearing such trademarks incorporate intellectual property that is owned and licensed to others by SGI. All other trademarks are the property of their respective owners.